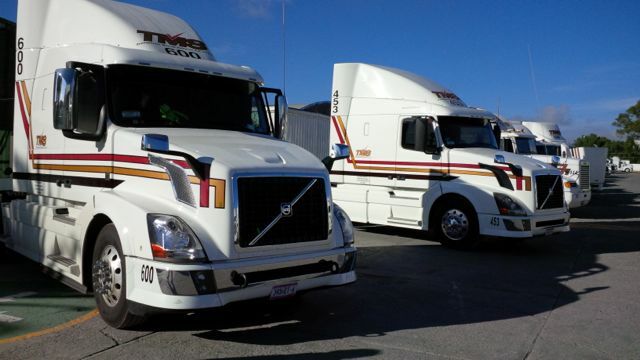 Two new Volvo trucks with I-Shift recently purchased by TMS in Mexico. It has been a bit of a slow couple weeks since the last edition of Hooked Up, but that’s all about to change. I’m writing this edition from Mexico, where I’ll be visiting some truck fleets and reporting on various news from the Volvo Group. We’ll also be taking in Expotransporte, Mexico’s largest trucking trade show, but my report from there will have to wait till the next edition, since the show starts later this week. For now, a couple thoughts on the Mexican truck market. It’s a growing market, representing about 25,000 units, making it comparable to Canada. For that reason, the OEMs are taking notice of the opportunities here. We tend to think of Mexican fleets as being low-tech and unsophisticated. But today, I had the chance to visit a fleet that’s anything but. Transportes Monroy Schiavon (TMS) runs close to 500 tractors (which is rare in Mexico, where only about 100 fleets operate 100 trucks or more) and has just taken delivery of the very first Volvo trucks with I-Shift to be sold into the Mexican market. This is a big deal for TMS. Laura Mandujano Valdes, commercial director with TMS, lamented that Mexican trucking companies often get overlooked when new technologies are brought to market elsewhere. The company waited patiently for Volvo to bring the I-Shift to Mexico, and placed an order as soon as they were able for 100 VN trucks with I-Shift. The first 25 have already been deployed and have accumulated close to 300,000 kms. The company told us it has seen a 5% fuel economy improvement thus far with its I-Shifts, and remember, these trucks aren’t yet broken in. You know, we all have our ideas of what the Mexican trucking industry is like, but a visit to TMS will dispel many of those misconceptions. This is a company that has a 24/7 on-site health centre. Before a driver sets out on each and every trip, they must first undergo a health inspection within one hour of their departure. Their blood pressure, temperature and other health indicators are measured and if they require medication, it’s provided free of charge right then and there. Think about that for a second. We have our wellness programs here in Canada and many of them are very good, but this company makes every driver undergo a mini-physical before every single trip! Security is a big issue in Mexico – that much is true. TMS drivers are encouraged to travel in convoys and they can only stop to eat or fuel in pre-approved locations. Dispatch watches them like hawks, because they have to, in order to protect the drivers and their cargo. Security also extends to overseeing new hires. Laura told us that in Mexico, many drivers consider the company’s diesel fuel to be an extension of their wages. They’ll often siphon off fuel and either sell it or give it to friends and family. TMS has an exhaustive hiring process that includes background checks, several rounds of interviews, a road test and more. Driver turnover is a big issue in Mexico, but with an industry-wide average of about 60%, it’s still well below US levels. TMS’s turnover stands at about 25%, which is a point of pride for the company. TMS has partnerships with some of the biggest American fleets, including Werner and Schneider, and swaps trailers with them at the Mexico/US border zone. Asked if TMS was interested in taking part in a pilot project that would allow it to deliver loads into the US, Laura very quickly said they’re not interested one little bit. Why? She’s afraid their drivers would abandon their trucks and stay in the US. That said, TMS drivers do quite well. Laura said they make about $30,000 per year (about 1.2 pesos per kilometre), which in Mexico goes a long way and in some cases professional drivers can make as much as, or more than, doctors. Still, as in Canada and the US, Laura said truck driving is not considered a desirable career, even though the earning potential is decent. TMS is looking to change that by raising the professionalism of its organization and its driving force. This includes giving them the latest technologies, like modern trucks with advanced automated transmissions. I have a lot more to say about TMS and the Mexican trucking industry in general, and I’m just now wrapping up day two of a five-day visit. Check back at Trucknews.com for updates throughout the week.